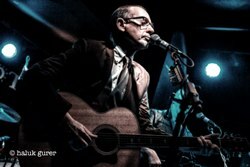 This country has produced some of the best music in the world created by some of the greatest musicians over the last fifty or so years and then there is the legendary Andy Fairweather Low founder member of Amen Corner, sporadic solo artist (given his hectic schedule) and one of the best and most in demand session guitarists. Over the years Fairweather Low was recorded and toured with such artists as The Who, Roger Waters (Pink Floyd), Roy Wood, Eric Clapton, Leo Sayer, Gerry Rafferty and Kate Bush. This was his second ever appearance here at The Flowerpot and the gathered fans were in for a real treat. The Low Riders comprised Andy on guitar/lead vocals, Dave Bronze bass/vocals, Nick Pentelow saxophone/clarinet and Paul Beavis on drums. A fantastic band that made playing the concert look so effortless. The set showcased songs that inspired and influenced Andy through to Amen Corner and some of his best works as a solo performer. Split into two sets the highlights from the first set included Life Ain't No Competition, Route 66, Spider Jive, Hymn 4 My Soul, High In The Sky, Putting It On In Style and La La Music. After a short break the band were back on stage kicking off the second set with La Booga Rooga. Set highlights were Lay My Burden Down/Will The Circle Be unbroken, Bend Me Shape Me and Wide Eyed And Legless. The gig ended with (If Paradise Is) Half As Nice. Andy Fairweather Low and The Low Riders were clearly enjoying themselves on stage encouraging the crowd to sing and clap along on some songs and were so energetic that they would have put a band half their age to shame. It was one of those 'pinch yourself moments' to be in the presence of such a music great in a fantastic small venue. A contender for gig of the year!